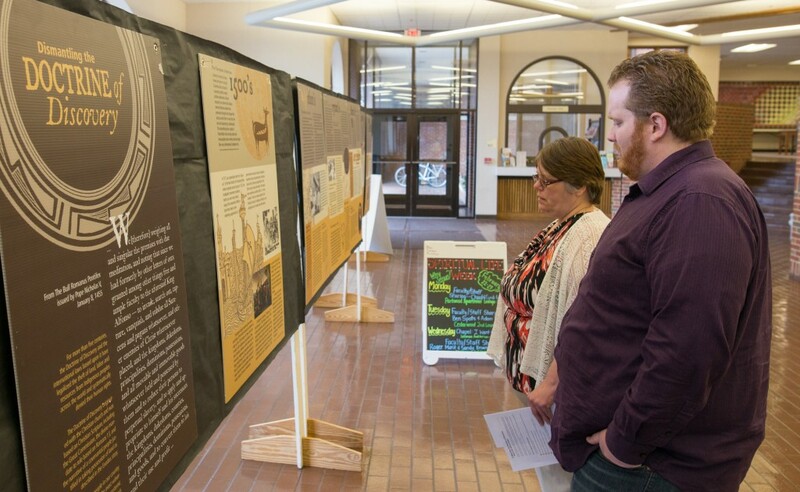 The traveling history exhibit “Dismantling the Doctrine of Discovery” is currently open at Eastern Mennonite University’s Campus Center through March 2. The discovery doctrine is a “philosophical and legal framework dating to the 15th century” that supports the way in which colonial powers claimed land belonging to indigenous peoples, according to exhibit coordinators. In the United States, Supreme Court rulings, beginning in 1832 and continuing through 2005, support this doctrine. Some modern legal theorists have posited its premises are controversial. Two staff members from Mennonite Central Committee, which sponsors the exhibit, will also be on campus Wednesday, March 2, for a chapel presentation in Lehman Auditorium at 10 a.m. and a participatory workshop, “The Loss of Turtle Island,” from 7-8:30 p.m. in the Campus Center Greeting Hall. The workshop, which was created by the Canadian ecumenical justice organization KAIROS and later adapted by MCC Central States, helps people see their place in the larger picture of Native American history. Both the exhibit and events highlight often unheard narratives from Native American history and challenge commonly held assumptions about indigenous peoples in the United States and Canada. The church’s role in injustices and human rights violations that occurred in the Western Hemisphere beginning in the 15th century is also noted. The World Council of Churches, as well as several other Christian denominations, including the United Church of Christ and the United Methodist Church, have made resolutions in support of repudiation of church involvement in the doctrine. In 2007, the United Nations passed the “Declaration on the Rights of Indigenous Peoples,” and has held multiple panel discussions from global representatives of indigenous peoples on the Doctrine of Discovery. MCC Central States staff Erica Littlewolf and Karin Kaufman Wall will make the chapel presentation and facilitate the evening event. Littlewolf, who coordinates MCC Central States’ Indigenous Vision Center, is from the Northern Cheyenne tribe of southeastern Montana and currently lives in Albuquerque. Wall, who lives in North Newton, Kansas, is peace and justice education coordinator for MCC Central States and previously worked in Bosnia-Herzegovina. It is the first Virginia visit for the exhibit, which has previously appeared at the Mennonite Church USA Convention, Mennonite World Conference Assembly and other sites. A group of Mennonite church leaders created the display to educate and raise awareness among Mennonites and others. The two guest presenters will also visit a “Globalization and Justice” class, as well classes in social work practices and policy.